Leg warmers are versatile leggings that can be worn outdoors or indoors. Knit your own leg warmers, quickly and easily, to create a pair of customized leggings that will complement your wardrobe. Circular knitting needles or double-pointed needles will make this a simple project for knitting in the round. It also is small enough that it can be taken anywhere and worked on as time permits. Choose your yarn. Go with a thick, bulky yarn to knit warm leg warmers or double a lighter-weight yarn for the same effect. 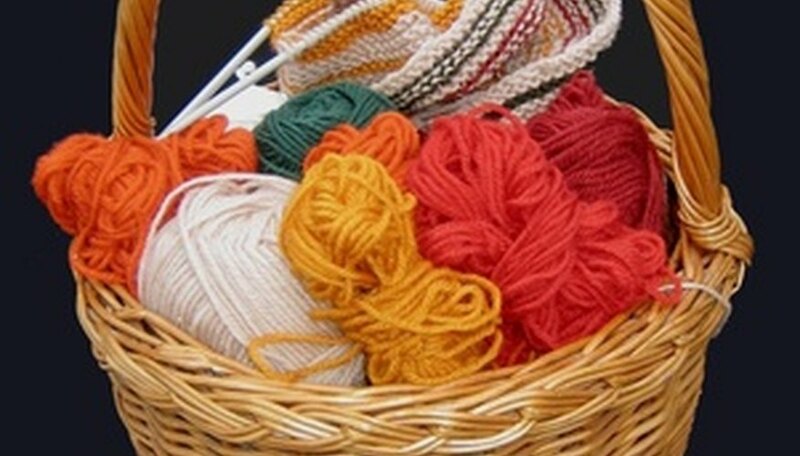 Variegated, solids, self-striping and jacquard yarns are among options from which to choose. Plan on purchasing about 500 yards of the yarn of your choice, being sure to stay with the same lot numbers for color constancy. Choose your knitting needles. Typically, you will use two different size needles, one about 2 sizes larger than the other. If using bulky yarn, size 17 and 19 needles will work. If working with lighter yarn, size 8 and 10 would work. Cast on your stitches. For an average adult woman, using bulky yarn and size 17 needles, cast on 20 stitches. If using smaller needles, you will need to cast on more stitches. For size 9 needles, cast on 40 stitches. Join the stitches in the round, being certain not to twist any stitches. It is helpful to place a stitch marker either before or after the first stitch so you know where your rows begin. Work the first eight rows in a knit 2, purl 2 rib pattern, taking care to keep your stitches from twisting. You can use a knit 2, purl 3 pattern if you prefer. Or simply begin knitting in a stockinette pattern (knitting every row). Change back to your larger needles and knit eight more rows in stockinette, simply knitting each row. Begin a new pattern of knit 3, knit 2 together, then knit to the last 5 stitches. Handle those by slipping one stitch, knitting one, passing the slipstitch over and then knitting 3. If you began with 20 stitches, you should now have 18. If you began with more stitches, you should still have decreased by 2 stitches. If you are not comfortable with decreasing stitches, feel free to just work the leg warmer in stockinette stitch throughout. You will not have a close-fitting garment, but it will still look great. Knit the next four rows. Repeat the decrease pattern to end with two fewer stitches again. Change back to the smaller knitting needles and resume the knit 2, purl 2 rib stitch from the beginning of the project. Complete eight rounds in this pattern. Again, feel free to knit in a simple stockinette stitch instead of adding ribbing if you would like. Bind off your stitches, preferably purl-wise. Begin the entire process again for the other leg. Looms can also be used to knit leg warmers in the round. They are easier for novice knitters. Experiment with alternate patterns and decreases. Don’t be afraid to try new ideas. Add stripes if you like, simply changing colors at the beginning of a round.